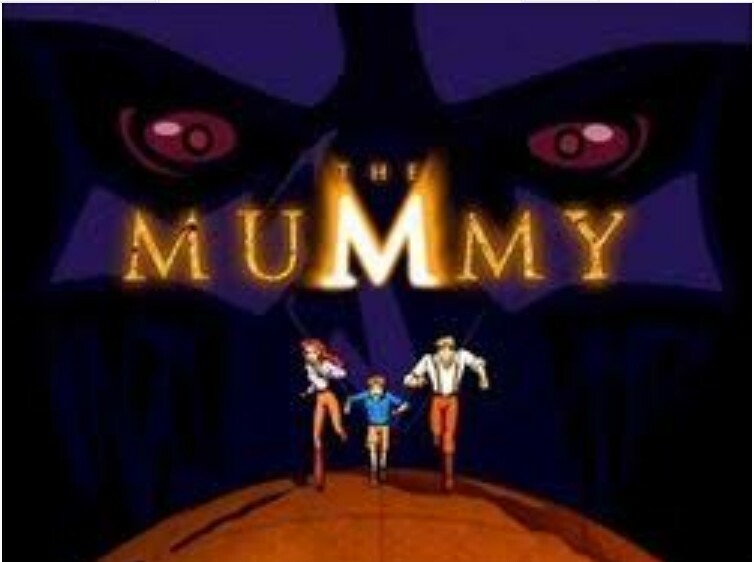 After the Mummy Returns hit cinemas the next Mummy adventures came on the small screen. The Animated series plays out as a stripped down version of the Mummy Returns. The O'Connells find the Manacle of Osirus and young Alex puts in on his wrist. Lots of running around the world trying to get it off of him. Imhotep no longer was trying to ressurect his girlfriend, he was trying to steal the manacle. Rick no longer uses guns, instead like another adventuring hero uses a whip. But this is a kids cartoon and I'm willing to over look these changes. Alex is now about 10 or so here so we are a couple of years after the Mummy Returns and you'd think Alex would know better. There's no real mention of the earlier films. The pilot "The Summoning" mentions that Evie discovered the Book of the Dead and donated it to the British Museum of Antiquities. But no real mentions of previous battles with Imhotep. Evie is hired as Chief Archeologist of the Bristish Museum of Antiquities and given a Zepplin to fly around the world. Her first job is the dig at Haminuptra, the city of the dead. However when Evie got the job, she got it over Colin Weasler who felt the job should have been his. Weasler steals the book of the dead, sneaks to Haminuptra and ressurects Imhotep. Silly man thinks he can control the mummy. Weasler is a lot like Beni from the first movie. The series is set all over the world as the family follow the path of the Scroll of Thebes and they encounter a variety of other supernatural creatures such as dragons, sand worms, werewolves, sea monsters, lave monsters, elemental creatures and griffons. Some historical figures appear in the series as we discover that Rick used to play baseball with Babe Ruth and Evie studied mathmatics with Albert Einstein. Each episode is about twenty minutes long and are enjoyable enough. They are non essential but they do scratch the mummy itch if you want a little bit more.